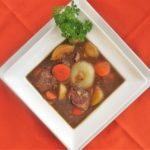 Beef Stew is made of simple ingredients; beef, potatoes, carrots and onions. It’s the process of combining these ingredients and the quality of the ingredients that takes it from simplicity to an orchestra of flavor. The method is to create layers of flavor, each building upon the previous step. Layer One: The Maillard Reaction. That may sound like the latest mystery novel, it is actually the chemical reaction that happens when raw meat is seared in a hot pan. The amino acids and sugars in the meat are rearranged, creating the caramelization. Through this process deep flavors and rich color are developed. Layer Two: Now that Maillard had a chance to react, its time to clean up his act. By adding a small amount of liquid, we were able to release all that flavor clinging desperately to the bottom and sides of the pan. The choice of liquid (wine, stock, water) adds another dimension to our layer. This recipe uses sweet vermouth and beef stock. Vermouth is wine which has been spiked with brandy and infused with herbs and spices. I didn’t want the wine to be a main character (as in Beef Burgundy), just another instrument in the orchestra. Layer Three: It’s time to break down the meat. 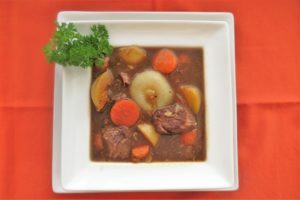 The process of simmering allows the collagen in the meat (what makes some cuts of meat tough and chewy) to melt away and turn into a soft gelatin (what makes the beef tender). I used cubed sirloin because I wanted deep beef flavor but also wanted to maintain sizeable chunks. Other cuts, such as chuck, have more connective tissue that breaks down and creates smaller pieces. Simmering versus boiling is important in this step. Boiling causes soluble proteins and rendered fat to break down, creating a cloudy stock. Simmering is a few gentle bubbles in the pot, the diminuendo of our cooking concert. Layer Four: The roasted garlic and cippolini onions. Roasting the garlic changes the profile from sharp to sweet and mild. They maintain an onion flavor with underlying notes of sweetness. A perfect combination with the sweet layer of flavor from the roasted garlic. Layer Five: The final layer is adding the vegetables. 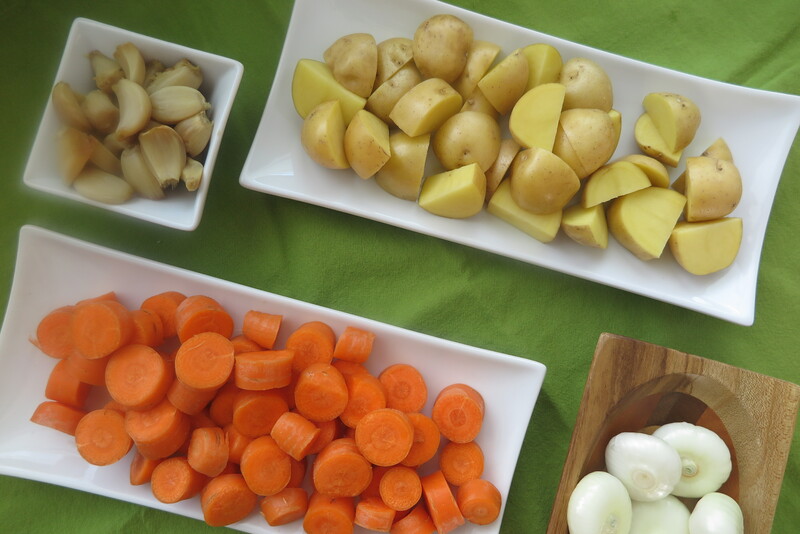 Adding the vegetables at the end allows the vegetables to maintain their individual flavor profile. A sweet carrot and buttery potato cook long enough to seep their delicate flavor into the stock. When you add everything to the pot at the beginning, the flavor of the stock and beef become inundated into the onions, carrots and potatoes. And, I am afraid, your roasted garlic will disappear into stew world never to be seen again. This recipe creates a medium body stew that brings out layers of flavor in every bite. Let the orchestra play on with every tantalizing bite! Season stew meat with the steak seasoning. Heat a 5 ½ quart Dutch oven over medium heat. Add just 1 tablespoon vegetable oil. Once the oil is heated, add the stew meat in three separate batches. Do not let the meat touch in the pan, this will cause the meat to steam opposed to browning. 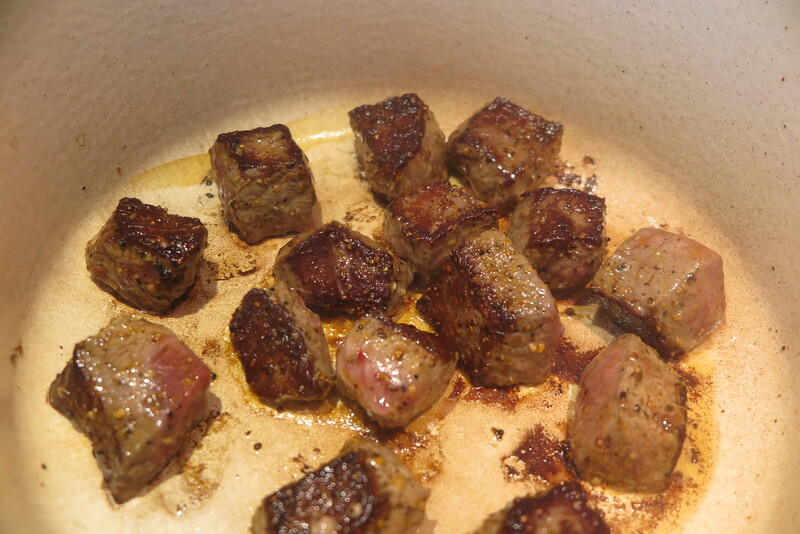 Sear the stew meat for 2-3 minutes per side, or until it has browned. 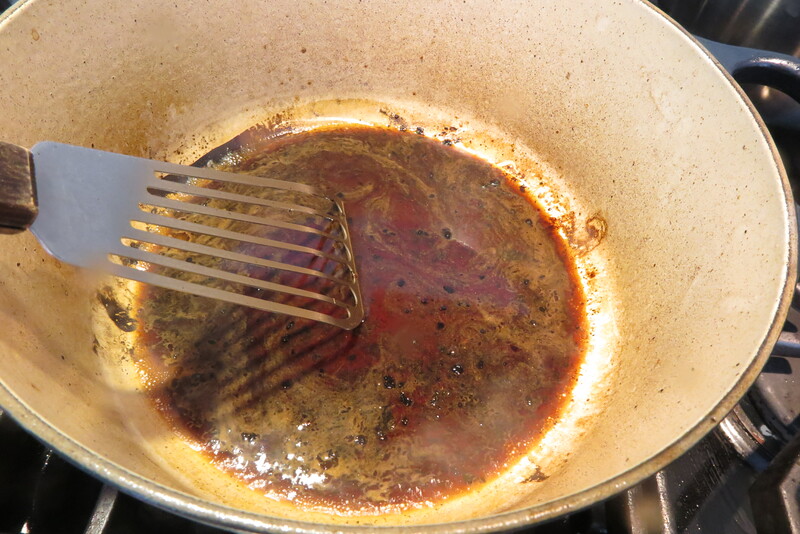 You may want to add more oil to the pan between batches if the pan becomes dry. Continue by browning two more batches of stew meat. This is an important step that releases all the robust flavor that is seared to the bottom of the pan. While the pan is still on the heat, add the vermouth and ¼ cup of the beef stock. With a flat sided wooden spoon or a spatula, scrap the bottom and sides of the pan. Keep scraping the pan until the pan appears clean and free of any browned remnants. Add the remaining beef stock and the browned beef with the meat juice. Bring to a boil then reduce to a simmer. Cook for 1 ½ to 2 hours. Preheat the oven to 350 degrees. 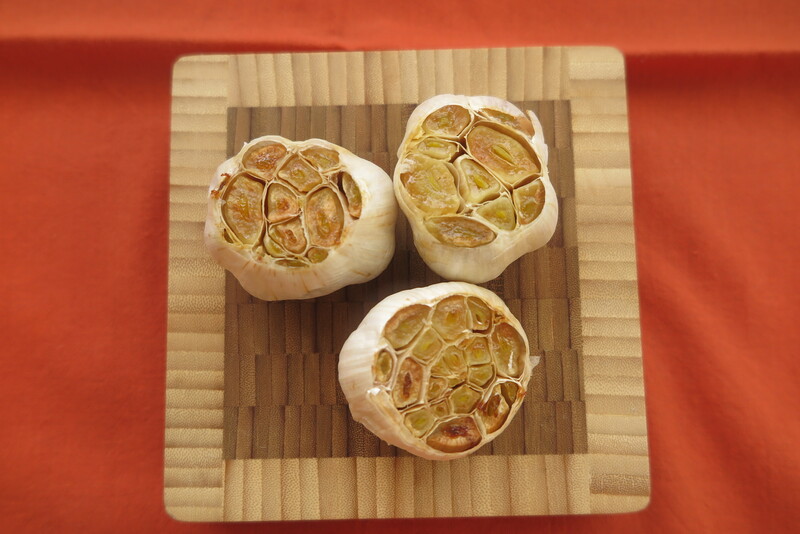 Cut the top off each garlic bulb, place on individual pieces of foil. Drizzle the cut top with olive oil. 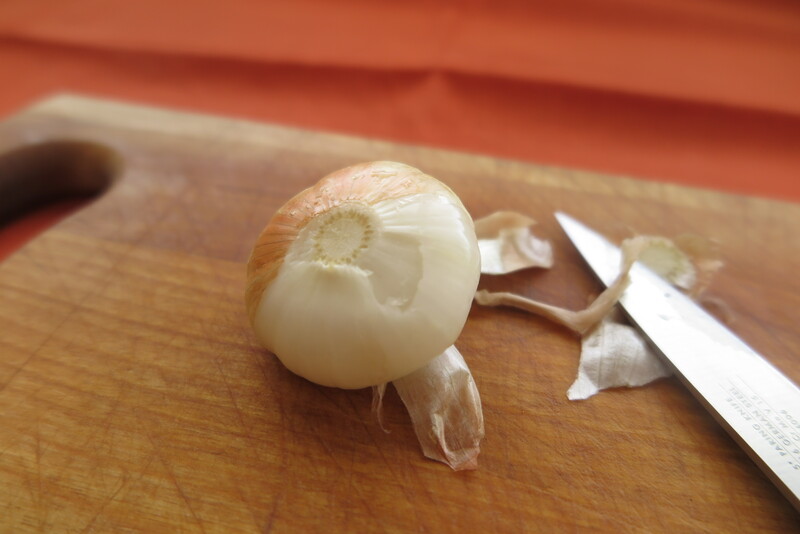 Wrap each garlic bulb in foil (the shinny side of the foil should be on the inside). Roast for 30 minutes. Let cool. Once cooled, gently remove the garlic cloves and set to the side. This method makes it easy to peel the onions without cooking them. Place cippolini onions in a heat proof bowl. Boil enough water to cover the onions, about 2 cups. Once the water is boiling, pour it over the onions. Immediately drain the onions. When they are cool enough to handle, cut the bottoms of the onion and peel away the outer skin. Set to the side. Before adding the vegetables, you will want to skim the fat off the top of the stew. Place the Dutch oven half off the burner. The simmering stew will force the fat to the side of the pot that is no longer over heat. Submerge a soup ladle just far enough into the stew to allow the fat to drain into the ladle. Continue submerging until the fat has been removed. Add the potatoes, carrots, roasted garlic and cippolini onions. Simmer an additional 45 minutes. Stir corn starch and water together until the corn starch is dissolved. Slowly add to the simmering stew. Simmer an additional 20 minutes. I like to use a scrubby to clean the carrots rather than using a vegetable peeler. You remove less of the carrot and give the outside a shiny smooth finish. Also, when cutting the carrots, you want them to be similar in weight. You’ll need to slice the thinner carrots into larger pieces, the larger carrots into thinner slices.